#162 - "All Hail The Power of Jesus Name"
#250 - "The Great Redeemer"
What is the greatest gift you ever received? It may be a thing given to you; it may be an act that benefitted you; it may be an experience you were allowed to participate in to your benefit. In everything you have received, whether it is a thing, a beneficial act, or a beneficial experience, what is the greatest gift you have ever received? Whether you know it or not, whether you yet understand it or not, the greatest gift ever given to you whether a thing, an act, or an experience was given by God Himself. For you to understand the greatness of God's gift, we must go back to the first century world. When you hear the word "redemption," what first comes to your mind? In your thinking, is it a "religious word" or an "every day life word"? To most of us, it is a religious word. But that was not the situation in the first century world. It was a very real, very practical, everyday life word. In a very specific way, the equivalent of our English word "redemption" meant "freedom." In their language, this word was directly associated with the payment of a ransom. One of the harsh realities of the first century world [and before] was the status of people who were prisoners of war. To be a prisoner of war you might have been living in a city that was captured. You might have been a soldier in a defeated army. Whatever happened, you were a captive, and captives were sold into slavery. Slavery did not follow racial lines, or social lines, or economic lines. Any prisoner of war likely would be sold into slavery. You may have been free before capture, but after capture you became a slave. As a slave, you no longer owned your life or yourself. You existed to do as you were told. Typically you were not asked if you liked being a slave. Typically you were not asked about what you liked and what you felt. Typically what you liked and how you felt were of no concern to those who owned you. The common way to escape the slavery occurring when you were captured was the payment of a ransom. If someone ransomed you, you could be freed from slavery. There are actually a few records of a few prisoners of war who committed suicide because they knew no one who would ransom them. I want you to feel a situation. First, think about your circumstances. There was a war that involved your city, and you were captured. You did not know one single person nor a group of persons who could pay your ransom. So you were sold into slavery, and you fully expected to be a slave for years and years. Everyday you did as you were told with no hope of every being rescued from your slavery. It was just a dreary, "get up and do what you are told" existence for you every single day. Then one day, when your hopelessness had almost reached the point of total despair, you were informed someone you did not know, someone you owed nothing to, someone you could never repay, had paid your ransom in full, and you were to be freed that day. How would you express your joy? Can you imagine going from hopeless despair to jubilant freedom in one day? What would you feel toward the person who made your freedom possible? If you are in Jesus Christ, that is what God did for you--He gave you your freedom by paying the ransom that liberated you from evil's slavery. Matthew 20:28 "just as the Son of Man did not come to be served, but to serve, and to give His life a ransom for many." 1 Peter 1:17-19 If you address as Father the One who impartially judges according to each one's work, conduct yourselves in fear during the time of your stay on earth; knowing that you were not redeemed with perishable things like silver or gold from your futile way of life inherited from your forefathers, but with precious blood, as of a lamb unblemished and spotless, the blood of Christ. Ephesians 1:7,8 In Him we have redemption through His blood, the forgiveness of our trespasses, according to the riches of His grace which He lavished on us. Would you pray with me as we give thanks for the gift of Jesus' body? Would you pray with me as we give thanks for the gift of Jesus' blood? #147 - "I Stand Amazed"
#781 - "Thank You, Lord!" #718 - "We Shall Assemble"
20 years ago, Jawad Amir supported a religious leader who opposed Saddam Hussein. Hussein responded by placing an execution order on Amir. 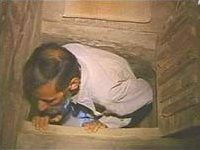 Amir went into hiding  not in another country, but in a space in the wall of his parents house. 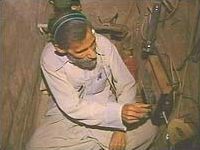 Amir lived in this space for 20 years listening to the news on his radio. 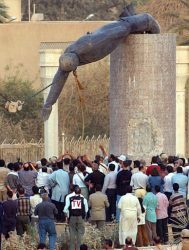 When he heard that Husseins statue was toppled he finally emerged from hiding. "We feel like we've been let out of prison," Arsalan Adnan says. "We can talk about anything." But Waffi Mahmoud Aswan, 42, an accountant "At least with Saddam, there was order in the city." About 50 men and boys, mostly from the Tikrit area, piled into pickups and drove around, firing guns into the air to celebrate Hussein's birthday. The men, mostly farmers, carried an array of modern weapons, including heavy machine guns and assault rifles. "Saddam is all we have known," Ahmed, 21, said between celebratory bursts of his Kalashnikov. "We will not be apart from Saddam for the rest of our lives, I tell you." Second chances are delicate and profound moments. Why? Because something has been paid to redeem a people from destruction. To waste freedom and redemption is incredibly disappointing and anguishing. We grieve when we see people around the world trade in their freedom for false security or idle pleasures. We are disappointed by those in our country who have opportunities to escape their circumstances but their own foolishness returns them to a life of misery. It is tragic when someone is given a new lease on life through costly surgery or treatment but they die soon after only because they refuse to change their habits. How often do we consider our freedom in Christ as a precious second chance? The ransom of Christs blood on the cross has given us more than just an exemption from condemnation  it has set us free to live a life that demands to be lived well! Ransomed by Christ  Galatians 5:1 - "It is for freedom that Christ has set us free." The death of Jesus on the cross is not a payoff to an angry God, nor is it simply payment for a hefty fine. The appearance of the Son of God threatened the powers of darkness and evil. Christs suffering and death was not meaningless nor an accident; it was necessary and inevitable given the conflict that exists in our world between good and evil, between the powers that would enslave us and the God who created us to live free. But the resurrection changes everything  death is not victorious in this conflict. Christ is exalted over all the living and the dead. Sins statue has been toppled. There is a regime change in the world that brings about new freedom because there is now a new, redeemed, free humanity in Christ. Lawlessness: Trying to be spiritual without worrying about our behavior. We are free  but that doesnt deny that there is a call to purity. Purity and holiness are benefits of freedom. If we lose these we abandon our freedom. How can we strive for the joy of Christ if we are chasing after things that fill our lives with more pain? We cannot serve two masters. Legalism: worrying about our behavior without trying to be spiritual. The message of grace and freedom is threatening to some. And they, like the Iraqis who would rather have the security of law rather than the responsibility of freedom, will put their faith in a religious system, tradition or church institution. Talking about freedom can be challenging and some get alarmed that there will be abuses. But when we focus on behavior and neglect the spiritual there are other abuses that are just as bad: We may keep all the rules and avoid any sort of conflict or slippery slope, but inwardly we have not changed and we justify rudeness, unkindness, and discord in the name of defending the faith. Jesus taught us that good behavior is not just about what we do  it also involves who we are. [If we accept legalism as righteousness, then we throw away the cross and, with it, Christian freedom] It is for freedom that Christ has set us free. Stand firm, then, and do not let yourselves be burdened again by a yoke of slavery. 4You who are trying to be justified by law have been alienated from Christ; you have fallen away from grace. 5But by faith we eagerly await through the Spirit the righteousness for which we hope. The only thing that counts is faith expressing itself through love. A Better Way: [Liberation  Living Free by Behaving Spiritually]. Jesus taught us that righteousness isnt just what we do  it is who we are. It is not just outward, it is inward. We have been set free  God has done this while we were still sinners. He acted, and we can only respond. But we do have a response  ability. The ransom demand is not placed on the one who set us free. The demand of the ransom is placed on you and me. Freedom comes at the cost of spilled blood. To have political freedom is an important and priceless reality, but to have spiritual freedom, release from the tyranny of sin, is greater still. For, one can be a free American citizen but remain an enslaved sinner. Only when one lives as a freeborn child of God is one truly free indeed. Youve been redeemed with the precious blood of Christ  How then shall you live? The invitation is to come to Christ. The invitation is to live out your freedom and share its benefits.